The Papo Dinosaurs Pachycephalosaurus was designed for dinosaur lovers from ages 3 and up. 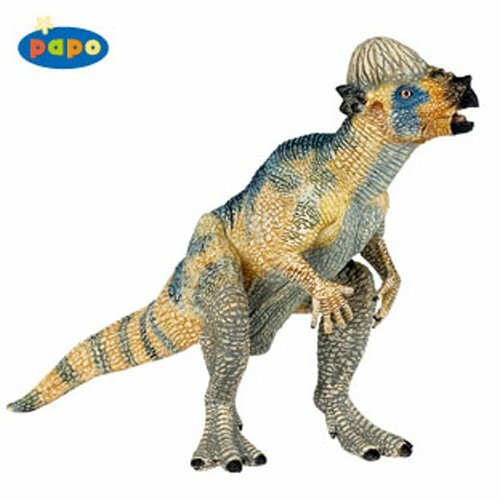 Papo dinosaurs are so detailed it isn’t really fair to call them dinosaurs toys and many collectors cringe at the idea of a 3-year-old banging around one of these Pachycephalosaurus models. The Papo Pachycephalosaurus is made from a semi hard rubbery material though, and is sturdy enough to withstand most anything, including a 3 year old. Detailed enough for the collector and tough enough for a kid. It measures 5.7 x 1.7 x 3.2 inches. All Papo dinosaurs are built to a 1 in 20 scale and are hand painted. The detailing that goes into the Pachycephalosaurus is outstanding. This particular dinosaur is a bit smaller than many others in the collection but that is because it is supposed to be a baby Pachycephalosaurus. 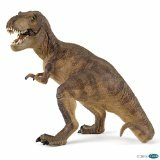 Papo Dinosaurs Pachycephalosaurus will make a great addition to any dinosaur collection or youngsters toy set. Perfect for any dinosaur lover. Best of all this dinosaur toy has nothing to break and doesn’t need batteries.